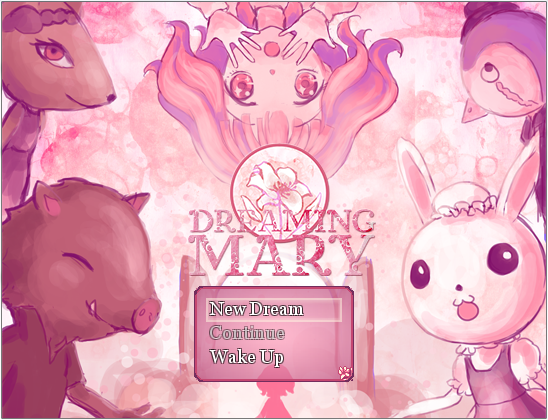 I really enjoyed Dreaming Mary. It’s really well put together, the dialogue and voices are simply incredible, and it has multiple endings that aren’t a chore to get and make sense rather than seeming like they’re just there because it’s custom. Play it with the sound all the way up! You need to hear what’s said. Look at how pretty everything is! Go play it. Go play it now. Go! Now. The degree the game commits to its pinkness is wonderful. You don’t see any random creepy stuff, and even just going off the path only shows you more ordinary things. It’d have been easy to pepper the main area with little scary bits but that’d have destroyed both the atmosphere and the sense of choice. The only creepy parts come in the final room of the hallway, and they’re exactly what they should be – extremely understated and disturbing in large part because of how much the dialogue tries to seem like there’s nothing wrong there either, even when it obviously is. It’s only when you choose to reject the safe areas that anything changes. The writing in general is just so well done. The way the animals talk to you when you fail one of their games is particularly striking. I’ve been playing a lot of translated games, and even if they were originally written very well, it’s hard for a translator to find all those subtleties and then reproduce an equivalent in another language. This really highlighted just how good quality writing could be for a game. Then there’s the way the story itself has an obvious and real split. I was nervous about the boar from even before I met him – he’s an extra door and when I first approached a voice told me not to. I found the secondary area, but couldn’t figure out what to do, and while the boar and the final room seemed wrong, I wasn’t sure going through that door would really be any worse than finding my way through the mirror side of things, and what else was there? I tried to keep saying no, but he was right that there was nothing left for me in the main dream. 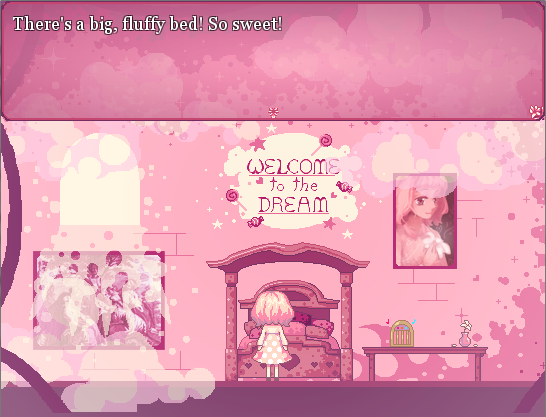 At first, the game seems to be going in a direction with purity/goodness, where you’re losing your white lily petals and get a bad end for it. But, not only does it not really change anything if you have zero or three when you go through the door, but you can lose all the games and be down to a single petal and still get the best ending. The two boar endings seem like they differ just by how beaten down she is at that point. To the degree it means anything, it seems like it means worrying about that is going down the wrong path. Then there’s the nightmare sections. I generally really hate chase sections. This one worked because they’re short and simple enough that you feel tension without having to deal with a dozen game overs as you figure it out. The fear is about not knowing what’ll happen next or how you’ll escape. I liked the drawing style as well – simple and scribbly, which worked particularly well because you’re not supposed to be soaking in the art at that point but just trying to get out of it. 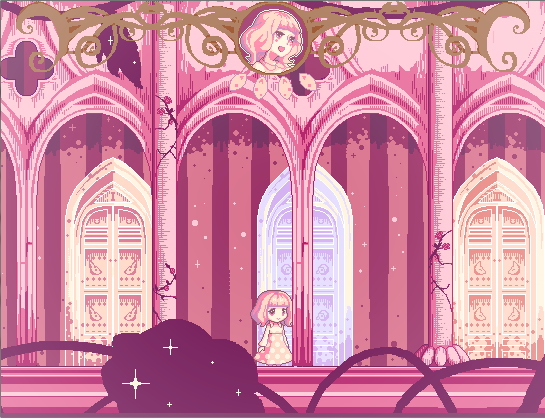 I would note that there is creepy stuff in the main areas: once you play the final rounds of the games, there are monochrome silhouettes of girls appearing in the rooms, one of them falling to her death behind the statues. But it’s pretty close to ending, so the point still stands. I liked the portrayal of the Boar. He is suspicious on the meta-level since his room is darker and the music is unnerving, but there isn’t anything in-universe that paints him as a bad guy until the ending. All in all, a well-crafted game. but there isn’t anything in-universe that paints him as a bad guy until the ending. Well, it’s not actual evidence, but I found the way he talks to you like an actual adult toward a child to be a big flag. The rest fit into a child’s own story, but he sounds like someone outside it – and worse, someone with his own agenda. Hm, yes, I can see how the way he talks is different. And then you are warned not to go there… Except for the fox who suggest it. Still, he is pretty subtle until you reject him and the red text of death starts. It’s good to see you liking something, you seem to have been disappointed by the crop of horror games lately. Something I liked about the presentation was the music. Every single track, even the mirror world theme, has the same basic melody… except for Boaris’ theme, which is jarringly different. It’s another subtle hint that something’s off about him from the beginning. I think the moral is that when looking for good writing, check your own language first.